You can also find the Nutrition Business podcast on iTunes and Spotify. Libby: I am here today with Jess Freeman of Jess Creatives and I’m so excited to have the chance to talk about design. Jess is helping me, she will be creating and redesigning my website and I’m so happy to have her shed some light and tips about SEO, platforms, and common mistakes that us dietitians make in the world of design and communication. Libby: Where are you coming from, Jess? Where are you living? Where are you tuning in from? Jess: I live just north of Atlanta. I usually tell people I live in Atlanta, but I’m really in the suburbs. Libby: Tell us a little bit about your role with design and how you got into it. I know this is now your full time job, so how did that happen? Jess. I actually decided in high school that I was going to be a designer. I got my degree in design, I worked for two years in the corporate world doing design, and I started Jess Creatives in my senior year of college. During college and when I was in corporate world, that was just on the side. I did freelance on the weekends and I was just doing a few projects here and there. I never grew up thinking I would be an entrepreneur. I didn’t even think Jess Creatives would be a full time thing until I was 45. But I kept growing my business, I started using social media for my business, and started blogging – all things to help grow my business. In the Fall of 2014, I was able to take Jess Creatives full time. I’ve been doing Jess Creatives for 7 years, but 4 years full time. Libby: Amazing. I love that you started in your senior year of college. I do research about jobs and working from home, and design and what you do is very high in demand. And especially for our community of Registered Dietitians. This is part of the reason why I am hiring Jess. While I like her design and work, I also know how important it is to take advantage of making your space and website work for you. The same way you want to make your social media work for you. Design and creation is not my speciality so it absolutely makes sense for me to hire out and have a specialist do it for me. And of course, when you hire a specialist you want someone to be in line with what you like. Jess has worked with some people I know, like Whitney and she designs my opt-ins. So it’s nice that we can all have that community. When I first saw Jess’s website, I loved it. It’s clean, minimalist, and clear. I love your opt-in handouts because they’re really, really helpful. A good sign of a website developer and designer is to make sure that they’re website is clear and you’re able to relate. And it’s a style thing too. For example, if I went to Jess’s website and it was messy and the elements of design weren’t in like with what I like, then I’d obviously not be attracted to it. You’ve done e-books, you have some stuff on SEO, and you have a YouTube channel with both you and your husband. I have really be enjoying your content. I believe what Jess tries to do is create social media content to attract people like me which leads me to relate to her. I see the aesthetics and they’re in line with what I want and I immediately hire her. So there’s out story! Jess and I actually connected on Instagram because that’s where I live. I’m not spending a lot of time on websites. I spend quite a bit of time on YouTube, but I didn’t find her on YouTube – I found her on Instagram. Jess did to me what I recommend everybody to do to their clients and it’s part of the reason I hired her. Jess responded to my stories on a couple different occasions and she asked how she could bring me value. In addition to liking her design and aesthetics, that’s why I hired her. There were a couple of stories that talked about resume professionalism, professional development, career building, and personal branding. Instead of telling me what Jess wanted to do for me, Jess responded to those stories by saying things like “here’s how you can get more information about that” and “here’s a person you can talk to about pitching” and “you can connect with this person about resume building.” I was so impressed by how you networked with me that I said we need to schedule a call. And the rest is history! If you remember the infographic I posted on Instagram earlier this week, step 4 is to ask other people how you can help them. I’m telling you, when you do that, that’s how you make money! This is an example. Living proof. I wanted to share that story with you today because it’s really powerful. The more you genuinely help people, the better it is for your business. Jess: Your not the first person I’ve connected with that ended up hiring me as a result of interacting on Instagram. I tell people all of the time that posting consistently, educating, and using hashtags all matters, but every time I’ve genuinely and regularly engaged with people, they have hired me. Sometimes that means answer questions and sometimes it’s like I did with you when I recommended additional resources. My intention was never “I’m going to get Libby to hire me.” I was just genuinely making recommendations because it was top of mind. And look where it led us! Libby: I wouldn’t have minded at all if you came to me and told me you were trying to get my a client. I would say good for you, that’s an amazing strategy. At the end of the day, I can tell when someone’s authentic. When we had our call the other week and we chatted a little bit about auditing my website, next steps, and what I want to do in my business, I could tell immediately that Jess was there to help me. It starts with your first impression and connecting. The next steps will follow. In order to really help someone, you have to do the work and understand the value you can bring someone. This is business. Jess is an entrepreneur and has been doing this full-time for 4 years. She knows the drill! It’s important to take advice from someone doing it full-time if that’s your goal. I’m almost full-time. I tell myself that I have a date on the calendar, but I think that’s great. So you’re into design, based in Atlanta, you started in college, and you’ve been doing this full-time for 4 years. Anything more we need to know about you or should we move on to the juice of what we’re talking about today: design for your website. Jess: I think we should talk about websites! Libby: Let’s start with common mistakes that people make that make you want to pull your hair out. Jess: I have a few. The first one is when people use way too many fonts and colors. I get it. If you’re not a designer at all, people still love playing with fonts and colors. It’s like a coloring book taken to the next level. We all like to be creative. Even if you say you’re not a creative person, you can still like to mess around with fonts and colors. I get that, but your website is not the place to do it. You should have 2-3 fonts and 2-3 colors. If you have a brand and logo, you should have a brand style guide that outlines your fonts and colors. Stick to those. That’s going to give you a consistent and cohesive feel. Like you said, my website is clean and nice. I’m a website designer, so I hope it would be, but what people don’t realize is that it’s consistency. When people go from my YouTube to my website or my Instagram, it feels cohesive. That’s very intentional. Think about Old Navy, Whole Foods or any other national company. They’re not jumping around and reposting Pinterest graphics or just slapping together some colors and fonts in Canva. They’re very intentional. I know we like to play with fonts and colors, but pick your 2-3 and just stick to them. That’ll really increase your online brand recognition. Libby: That’s a great tip. What about folks that are starting out and are intimidated because they’re not “big enough” yet? Do you have any small steps? For example, is it better to start with one platform and master the color scheme before trying to cross over and have other online presences? Jess: Definitely start with what you can handle. Don’t go from zero to 100 because you’re going to burn out in a week. Especially with Canva. Most people use Canva or at least knows what it is. In Canva, you can save your colors for free. If you pay, you can even save your fonts. It’s super easy to choose your fonts and colors in Canva and use it consistently across all of your platforms. So if you really like Instagram, just stick to Instagram. You don’t have to dive into all of the different social media platforms. I’m on Twitter and Facebook, but it doesn’t do a lot for my business. I don’t get a lot of value from it besides Facebook groups. Even that’s a little touch-and-go. I spend a lot of time on YouTube and Instagram because they’re the biggest drivers in my business. Libby: I love your YouTube! I enjoy the quick clips, tech-focus. And it’s very well branded and I love your thumbnails. Those thumbnails are super important in the world of YouTube. So consistency makes sense for brand recognition. I say the same thing when I teach dietitians about Instagram. You want to have continuity within your Instagram feed. Fonts, colors, photos, style, etc. You want fluidity so that when you have a post, people know it’s yours. These things are important when you’re branding yourself across multiple platforms. Jess: If you’re just starting out and don’t even have a logo, don’t even start your website yet. Pick your brands and colors first. Last month, I made a brand style guide for someone who doesn’t have a website or a logo. He (my client) just wanted to be more consistent online because he’s heard me talk about consistency over and over again on YouTube. Just start with that and once you get to a place where you can have a website and/or logo, you can either keep using that or you can change it up. Rebranding is totally fine if your style changes once you’ve found your place, personality, and brand. Libby: I’ve done that (rebranding) several times myself. That’s a great tip. When you’ve found some clarity and focus, make sure your colors and fonts are on-point. What are some other common mistakes that drive you insane? Jess: The next one is when people fill their website with all of the things. Some people think their website is a “catch-all” that’s going to provide tons of opt-ins and drive people to all of their social media platforms. It can be overwhelming! You want your website to be clear and concise. Ask yourself: what do you want people to do when they go to your site? For example, when I first start working with a client, their answer usually that they want people to hire them and they want them to join their email list. I get it – me too! But you have to choose a number one goal. For me, my number one goal is clients. Yes, I want them to watch me on YouTube and join my email list. But you have to think about what your website is centered around. For me, that’s getting them to hire me. Initially, my clients want their homepage to have their opt-in, services, e-book, YouTube, Pinterest, etc. That’s too many things on one page! I think 2-3 calls-to-action is the most you should have. It’s like you’re walking down the laundry detergent isle and you don’t know which one you need because there’s too many options screaming at you. I’m not saying you can’t have both your Instagram and Pinterest on your website, just don’t highlight them all on the same page. On one page drive people to your blog and on another page drive them to your ebook. Reduce the number of calls-to-action on your website so that you don’t overwhelm people that come to your site. Libby: It’s interesting that you say that! In the web world, I’m not a pro in design, but I am a pro in writing copy that will help you reach your target audience. When it comes to design, I’m going to refer to Jess for all of that. With copy, you want one call-to-action because you want to direct people to one place. It sounds like it’s the same with design. My favorite websites are simple, clean, have the least amount of pages, and ask me to do the least amount of things. Jess: Exactly. That’s much better than being constantly shouted at and pulled in different directions. It’s like, can I just read a blog? Libby: As humans, business owners, and dietitians we need to flush out our ideas. I get it, I have a million ideas. I’m an ideas person, but a lot of that can just be a draft hanging out in my Google folder by itself. When it comes to publishing that content, it usually ends up being 1/4th of what I want it to be. More often than not, if it’s too much content, I just need to flush it out more. It seems that what you’re saying is very similar to what I say about Instagram which is: just ask people to do one thing. Jess: The last common mistake that people make is getting too caught up in it being pretty. Building a website and making it look pretty is the easy part. It’s the functionality and user experience that people forget about and push to the side. This goes back to having too many calls-to-action, websites being slow, confusing in layout, confusing copy, etc. You can’t forget about the user experience – keep it clear and simple. Like what you said about my website. Libby: I think we forget about that as business owners. Us business owners forget about the user experience because that’s not our field of expertise. The user experience is huge. Ask yourself these questions: Are they on their cell phone looking at the site? Their desktop? Where do you want them to go when they visit your site? These are all things you need to work with a professional on. I’m not knocking you if you made your website on your own, but you should at least have a professional review and audit it. You can’t do everything and if you think you can do everything in your business, you’re wrong. Jess: Think about it from the mind of a dietitian. I can make meal plans for myself all day long, but I’m not a dietitian. I can think that I’m hitting my macros and calorie limit, but then you guys (dietitians) are cringing because I’m eating 16 pounds of cheese and snickers just because it fits your calories. Not that I’m eating 16 pounds of cheese or snickers, but think about it that way. Everyone can DIY something, but at some point you have to acknowledge that you might not have any idea about how to craft a good user experience and navigate people through a website, so you have to bring in an expert. Just like how I have to bring in an expert to look at what I’m eating for maximum health and making sure that my nutrients are squared away and I’m eating healthy. Think about it that way. Even if you love your website, you have to ask yourself this important question. Do other people love being on your website? Libby: Do you find that people have business owners have 5 common things they want? For example, my clients often want high retention, sales, downloads, and this, and that. You’ll find it best to work on 1 or 2 things. Again, that’s where the user experience comes into play. You’re showing your ideal client where to go next and what to do. They don’t even think about it – it’s subconscious. Jess: Right now, your focus might be wanting to get more clients. 6 months or a year from now, that might shift to launching a course or a podcast. That doesn’t necessarily mean that you have to redesign your website because you have a new goal. If you have a new focus, it might be as simple as swapping out all of the places where you drive people. For example, instead of driving people to your services, your hire me page, or to book a coaching call, you redirect them to your launch page or podcast. But it might not be that easy. It might be a weird thing that matters more. For example, you might be directing people to your podcast in the middle of a random page. Just keep in mind that you can switch things up as your focus changes. It could be a simple swap or changing half of a page. 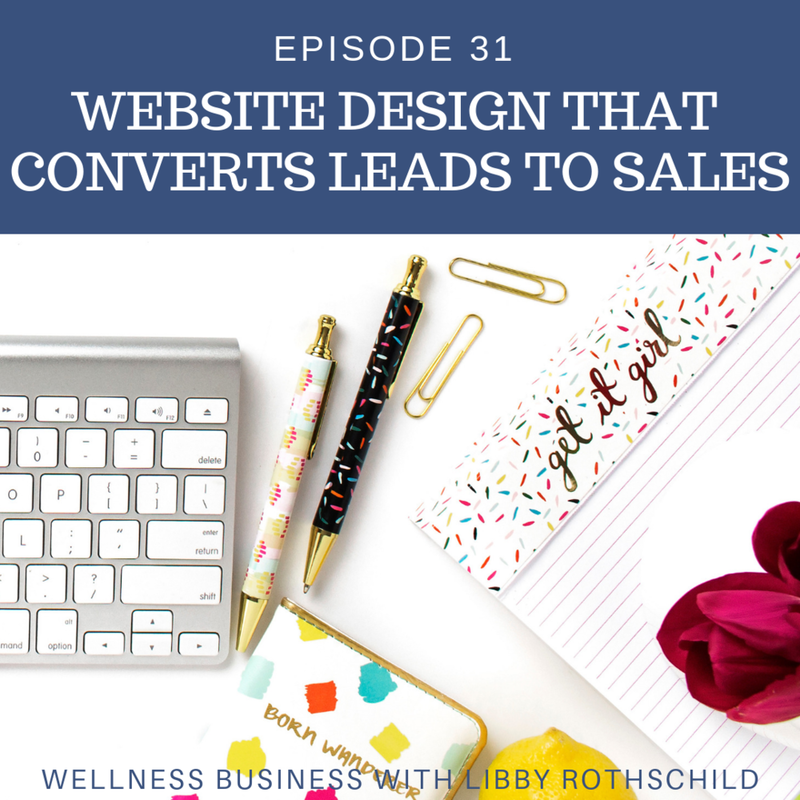 You rarely have to redo an entire website because you’re launching a course or podcast – unless you’re permanently changing your business in a drastic way. Libby: Some people are a little bit misguided with some of the rebranding and how some things can be simple and other things might need to take more attention. So what about platforms? I know there’s a lot of debate between things like Squarespace and WordPress. When it comes to someone like me, who’s not a website developer and has been putting the website on the backburner, it’s confusing. I just recently pulled the trigger and I have Squarespace now, but I find myself wondering if that was the right move. Jess: You are totally fine to be on Squarespace. I wholeheartedly recommend Squarespace and WordPress. They’re fantastic platforms and mobile-friendly. (Most WordPress themes are mobile-friendly. It depends on your WordPress theme.) They’re good for SEO, easy to use, easy to update, etc. If you’re on Squarespace or WordPress, you’re golden. If you don’t have a website yet and have no idea how to choose, know that Squarespace is for those who aren’t as tech savvy or need something simple and straightforward. For example, if you just need to show your services, blog, podcast, videos, etc. then Squarespace will work fine. WordPress is for those who want a ton of functionality. Squarespace can still do a lot of things, don’t get me wrong. Sometimes it’s just easier to do things in WordPress. If you’re comfortable with tech and you want specific things like a membership, trip wires, and other functionalities then WordPress is probably where I’d send you. I tell people all of the time to not use Wix, Weebly, or Blogspot and they’re not fully responsive. I can immediately tell if someone uses Wix because their content just gets cut off if the browser gets resized. Even if you don’t personally resize your browser, you can’t just assume that your users also aren’t going to resize their browsers. If you’re like me, I have this massive computer screen and I can dual-window it. I can use Illustrator or Photoshop side-by-side with my browser. I pulled up a photographer’s website the other day and I didn’t think she had a contact link or a blog because it didn’t show up in my browser. Once I changed my browser to be full-screen, I found three different pages. If you want to change the template you use in Wix, you have to actually start over. With WordPress and Squarespace, you simply have to switch the template. Libby: From my minimal experience, Squarespace is good at switching templates. I’ve found it decent to use, but I still have to put in the time to really understand what you want. It can be a lot. Jess: I spend all of my days in Squarespace and WordPress. I’m to the point now where I’ll be sitting in the car and friends will message me questions about how to do something in Squarespace and WordPress and I’ll be able to walk them through it by memory. I spend so much time in these platforms – it’s what I do. Yes, I am biased, I think you should hire someone when you can afford it and it makes sense for your business. Do I think that you have to have a developer-created website right when you start your business? No. If you saw my website when I first started my business, I wouldn’t be on the podcast today. Libby: It’s great that you say that. The same goes for me. We are all branding, rebranding, and getting better. It’s good to know that a web developer and designer has had moments when they had to to improve what they do. Jess: Exactly. Stick to Squarespace and WordPress. Hire someone if you can. Sometimes, you’re not in the spot to hire someone. For example, someone wanted to hire me but I was a little out of budget so they decided to watch my Squarespace tutorials on YouTube and I’ll come back to do an audit. That’s why I created the audit – so people can DIY and then come get help from a professional to look over their website. Libby: Do you want to explain what your audit means? Jess: The website audit is basically me combing through your entire website. I look at the design, whether or not the content (pictures, copy, etc.) makes sense, and SEO. I don’t rewrite the content, but I’ll tell you whether or not it’s clear what you’re selling. When I look at SEO, this is when copy and backend work comes into play. I write down everything I would change. It’s not simply “change this picture.” I’ll tell you that you need to insert a photo of yourself smiling here or you should change this background to magenta. I’m super specific. These reports are typically 3-4 pages long. It breaks it down page-by-page as well as the SEO. It’s literally everything I’d change or improve if it was my website or if it was a website I was working on. Libby: That’s a tremendous service. I love that you do the clarity as well as the SEO because they’re really important. I don’t know much about SEO so that’s something I’m looking forward to having you help me with. Trust me, copy still takes work, but it’s something I’m more comfortable with when I compare it to other topics you’re discussing. Jess: My suggestions are all doable. If you’re comfortable editing things on your website, it’s all things you can do. I won’t suggest things like “add CSS that does x, y, and z” and leave you confused. It’s all doable by you. Before I do the audit, we talk and I ask for your goals. What are your business goals? What do you want people to do on your website? Sometimes we get really lost and we want people to do 7 different things when they come to your site. You need to pick one per page. That way I’m not recommending that you make changes that don’t align with your goals. Libby: It’s good to evaluate and know what you want because it might change. Right now, you might want to build your email list, but next quarter you might want more clients. For example, Jess’s number one is clients. This means selling your services, not your products, right? Because she has products as well like digital downloads, guides, etc. Her services are her higher-end offer that she’s trying to push. So everything she creates should center around that. That’s why it’s important to think about how you want your website to act, feel, and look? And it’s okay if you want to change the focus from building your email list to showcasing your services. That can be intimidating for dietitians who are worried about changing their mind and wanting to focus on something else later. That’s okay, it’s all about shifting gears. You just have to make sure that your new focus is still clear. Is there anything you want to add about SEO? Jess: If you are in entrepreneur groups or have been reading online, you’ll know that there’s a lot of debate about SEO and what matters. Platform doesn’t matter as much as you think. Like I said earlier, Squarespace and WordPress are great for SEO. You can boost your SEO the most with content – blogs, videos, podcasts, etc. Anything that will drive people to your website. That’s the easiest way to boost your SEO. If you’re not showing up in search results for your city or you have something super specific you want to show up for, create content around that topic. Libby: I get what you’re saying and it’s so powerful. I have a tremendous amount of content and I’m not optimizing anything. My podcasts are just sitting there hanging out. Libby: And mine could be “Business Skills for Dietitians.” That also goes with just niching down. If you’re clear in your business and have niched down, you have a better shot at SEO. For those of you who haven’t niched down, this is another incentive! Knowing the specificity of tagging and whatnot is going to be really helpful. Jess: Adding those keywords to your page titles and site description is important. For example, if you have a page on your website called “services” it can show up as “services” on your website, but on Google it can show up as “business coaching for dietitians.” That’s a lot more clear for people who are looking for a business coach for dietitians. That can be in your homepage, site description, etc. Now that doesn’t mean that you need to change the SEO description of your about page to “business coaching for dietitians” because it’s your about page. Instead, it can say “Libby, business coach for dietitians” or “Libby, business mentor for dietitians.” Yes, they’re super similar. But small tweaks and rewording it can help people find you no matter what they search. Think of words that people might think of and sprinkle them around in other places in your website. For example, you can use the word “dietitian” most of the time, but you can include the word “nutritionist” to help boost your SEO. My last SEO tip is to submit your site to Google. Libby: Can you give some basic tips for people who want to submit their site to Google? Jess: Simply go to Google and type in “submit my site to Google.” A little box will show up and you just need to type in your site and hit submit. If the box isn’t there, click on the first link. This tells Google that your site exists. You’ll have a higher chance of being indexed sooner instead of waiting for the robots to crawl and find you. Libby: You’ve given us so much to learn, so much to do, and so many helpful tips. That’s a lot for us to think about, process, implement, and evaluate. Take a look at your website and how it matches up with your goals. Think about the colors and the amount of information on your site, try not to get caught up in aesthetics and lose sight of your message, know how important SEO is to your business and personal brand, and ultimately make revenue. And I’m noticing a lot of parallels between growing on Instagram and creating a powerful website. Jess: Yes, It all fits together. Libby: Any final thoughts? Where can people find you and learn more about your products and services? Jess: You can find me at www.jesscreatives.com and on nearly every social media platform @jesscreatives. Libby: Thank you so much for your time. I can’t wait to air this and I can’t wait for you to make my website too.